Who says going to work should not be fun? In the midst of World Cup soccer fever we had a night without football and took the opportunity to use the moment to grab a few beers, pizzas and get inspired to do something crazy in the office. The result? 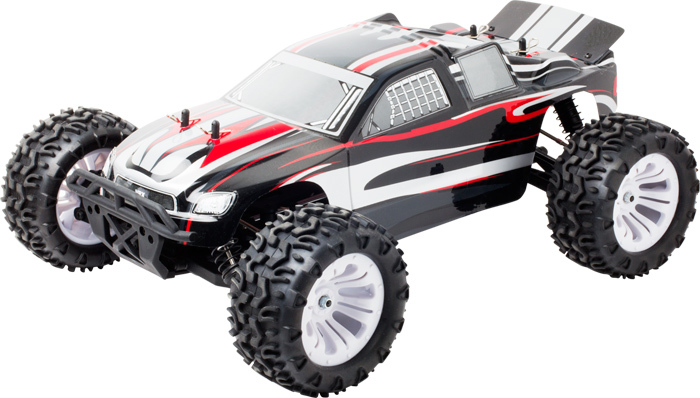 We hacked a remote control car replacing the radio controls with an arduino micro controller so we could control the car from our mobile devices instead. For the project we picked up a Sword 1:10 MonsterTruck 4WD 2,4GHz from our local technical geek store; mainly for its size (big enough to fit an arduino device inside) and the raw power and crazy suspension it had for extra coolness bonus points. Unlike Eric's initial attempt with the Raspberry Pi Car this time our goal was to not destroy the controls and see if we could directly integrate with the servo's of the car to control the steering and drive train of the device. 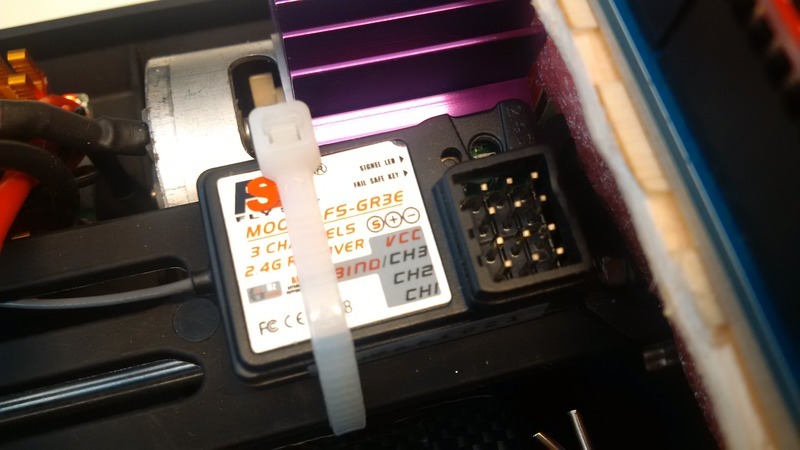 Inside the car we found the FS GR3E Receiver (pictured) and after investigation with an Oscilloscope we saw specific signal patterns to the servo devices. The FS GR3E has three channels; only two of them were being used in this case (one for steering, the other for the drive train). It was clearly indicated on the receiver that there was a signal, power and ground connection and that 5.8V was being passed to the steering servo. 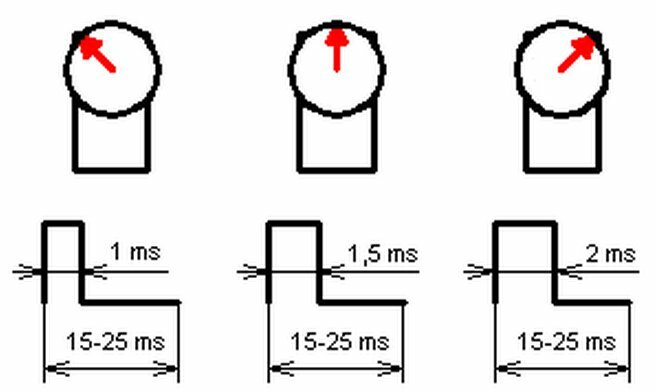 The servos were being controlled with PWM (pulse width modulation) in a pattern as shown - we quickly identified that we only needed to connect the ground and signal to our arduino micro controller and find a way to route power to it. We quickly wrote up a few simple sketches to test our observations - and viola! It worked! To keep things as simple as possible (golden rule) we wanted to implement a multi-threaded arduino sketch, one thread to monitor network activity and the other two to send consistent pulses to each servo. Multi-threading isn't really something out-of-the-box on the arduino, but we came across Scheduler ARM/AVR which gave us exactly what we needed. After some fine tuning and experimentation we tweaked our pulse width modulation patterns (MIN, CENTER, MAX) within the range the car could handle and after reading a forum post about latency of multi-threading to adjust the exact timing to be acceptable. The only modification we needed to make to the car itself was to cut the 7.2V power line from the battery and solder a power cable direct to the arduino - which can handle any input voltage from 6-20V (reference: arduino.cc); the rest was just simple wiring, basic shielding (aluminium foil between some foam) and securing everything down with zip ties. One thing we wanted to ensure was the ability to restore the car back to its original controls. 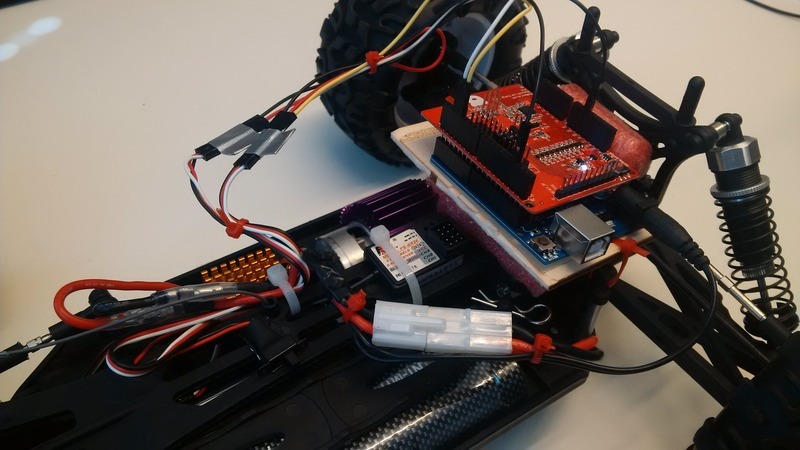 The resulting arduino sketch is available for download below - it is designed to be generic enough to work with any remote control car that uses two servos with pulse width modulation over a digital output pin. If you do manage to use the code for something, let us know! This concludes part one which focuses on modifying the car itself and integration an arduino micro controller - the next part will focus on the mobile application used to control the car using Evothings Studio on an android or iOS based device; we will also show some cool videos of the car in action!